I'm not sure why we haven't gone to Crazy Creekside Wednesday Nights until this week, but I don't think it'll be our last adventure there. The place was packed, the brews were cheap (meaning I didn't think I was in SB when it was only $3) and the dancing was real fun. 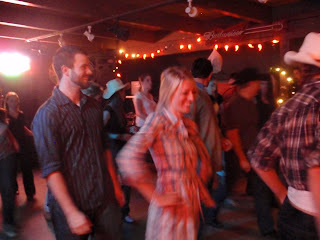 We had a little help from our cowgirl, and boy, friends and everyone got into it. January 7th...here we come...or maybe New Years Eve.